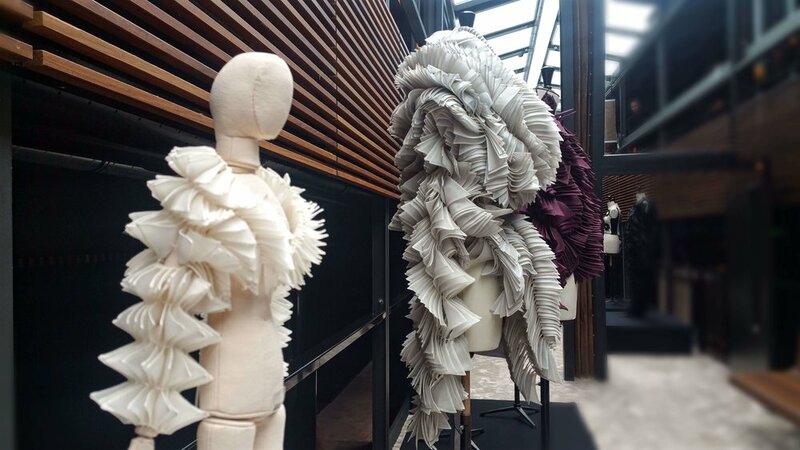 An architect by training, Maurizio Galante has applied his creative talent to a range of designs, from haute couture garments and opera costumes to furniture and interior design as he moves freely between disciplines. His Fall 2017 “Drago” couture collection revisits one of his most iconic designs; initially created in 1992, threaded together organza triangles create an “armor” that gently flutters around the wearer’s body, framing it as well as protecting it. 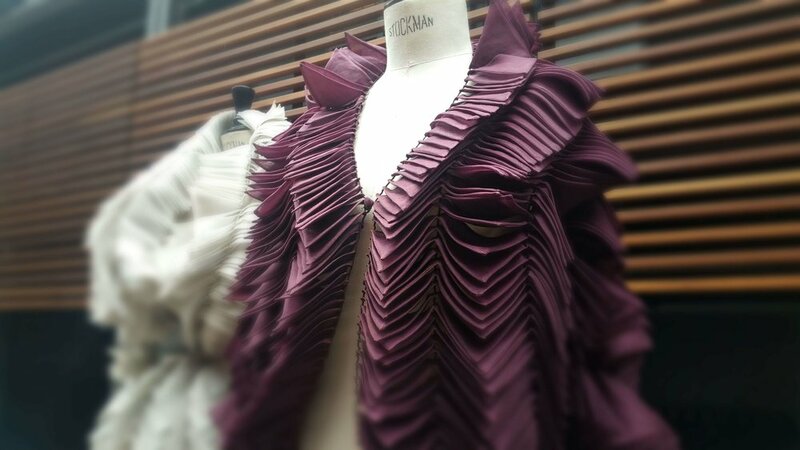 Alongside his first burgundy jacket from 1992, the designer displayed several new pieces including a striking black dress that envelopes the female form creating a sinuous silhouette in organza. The designs strike a balance between opposites, voluminous shapes with outrageous pointed scales reminiscent of dragons, yet surprisingly supple as they are constructed from feather-light silk fabrics. “I know this may sound strange by I don’t do fashion; my garments are wearable objects, supple architecture,” the designer explains while presenting his collection at the Hôtel OFF, the first four-star hotel floating on the Seine and with public areas and suites designed by Galante and his associate Tal Lancman. “Like flexible, fluid architecture, I see garments as living spaces that define the space around the body, shelter the wearer and frame her, emphasizing her gestures,” he adds. The presentation also showcased some of his one-of-a-kind furniture pieces and limited edition handmade vases, all of which are manufactured at his atelier.